Truex Jr., of course, proclaimed on Oct. 28 he would not let Logano win the championship after Logano crashed Truex Jr. to win at Martinsville. But Truex Jr. couldn’t help it when Logano sped past him in the decisive race at Homestead-Miami Speedway. Among this year’s championship contenders, Logano was the only driver without a title. Truex Jr. took the crown last year, while Kyle Busch won in 2015 and Kevin Harvick won in 2014. Now Logano joins the elite ranks of the sport at 28 years old. 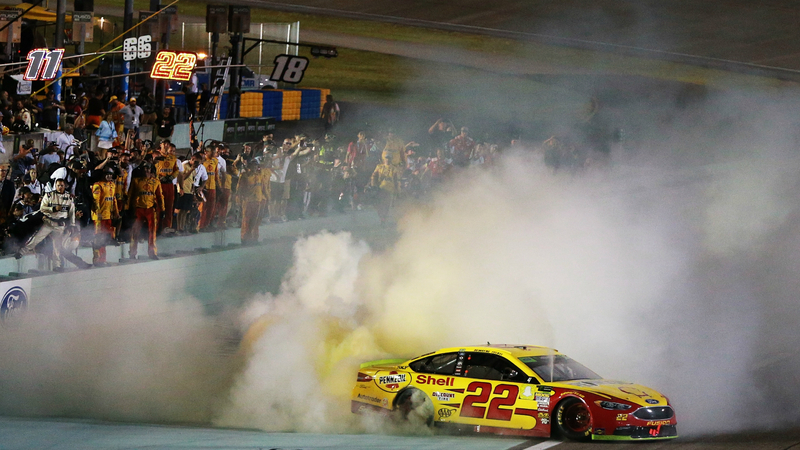 6:30 p.m. — JOEY LOGANO WINS THE CHAMPIONSHIP! 6:29 p.m. — Two more. It’s Logano’s to lose. 6:28 p.m. — Logano might just do it. He’s starting to pull away. Cole Pearn said to just keep hitting his marks and they’ll see what happens. 6:27 p.m. — Seven laps to go. Logano still in front. 6:24 p.m. — Logano makes a pass! He’s in first with 12 more laps! 6:23 p.m. — Logano is right behind Truex Jr. Wow. 6:22 p.m. — Truex Jr. pulls ahead after the restart! Fifteen more laps. 6:18 p.m. — This is setting up to be a great finish. Wowwwwwwww. They’re going to line up 1-2-3-4 on the restart, folks. 6:15 p.m. — Caution. Kyle Busch catches a break. 6:10 p.m. — It’s not looking great for Kyle Busch. He opts not to pit. Kyle Busch’s team committing to the “we need a caution or we lose” strategy. Still staying out. 6:07 p.m. — Logano beats Truex Jr. off pit road. 5:59 p.m. — Truex Jr. takes the lead. 5:55 p.m. — Here are the current standings. 5:48 p.m. — This is getting good. Sixty-five laps to go. 5:44 p.m. — Kyle Busch has had a dismal day coming off pit road. He’s back in ninth place after another debacle. 5:41 p.m. — Larson into the wall. Caution. 5:33 p.m. — Harvick is experiencing some car trouble. 5:25 p.m. — Logano to first. Truex Jr. to second. Brings back memories of Martinsville. P.2 – Martin Truex Jr.
5:15 p.m. — Larson takes Stage 2. He’s playing spoiler very well. 5:07 p.m. — Harvick back in the lead with 12 laps left in Stage 2. 5 p.m. — Welp. We get a caution for debris in turn 4. 4:54 p.m. — This is something to keep an eye on. 4:50 p.m. — If you’re wondering why we haven’t mentioned Kyle Busch too often, it’s because he’s back in seventh place. There are 30 more laps in Stage 2. 4:40 p.m. — We continue to have lots of movement in the front. Now Larson and Harvick are back ahead of Logano. 4:32 p.m. — This has been a fun (and clean) race thus far. 4:28 p.m. — Logano passes Harvick AND Larson. 4:26 p.m. — Larson takes the lead early in Stage 2. 4:17 p.m. — Harvick wins Stage 1! 4:14 p.m. — Kyle Larson — not in championship contention — is catching up to Harvick at the front. Larson is just eating into Harvick’s lead with less than 10 to go in the stage. 4:09 p.m. — Harvick leads by five seconds. 4:05 p.m. — Championship order through 62 laps: Harvick, Busch, Logano Truex. 3:55 p.m. — Harvick moves into first place. We’re 43 laps in. 3:50 p.m. — Busch remains in the lead. 3:36 p.m. — After 10 laps, Kyle Busch leads championship contenders, running in second place. Logano is in third, Truex Jr. is in fifth and Harvick is in seventh. 3:30 p.m. — Green flag! Let’s do this. 3:26 p.m. — Not what you like to see minutes before a championship race. “Oh man, you won’t even believe it. This track is dirty as hell,” Clayton Hughes tells Martin Truex. 3:11 p.m. — FLYOVER ALERT. 2:57 p.m. — Starting positions for championship contenders. 2:21 p.m. — We’re about an hour away. 2:04 p.m. — Here’s Logano talking before the race. 1:18 p.m. — Can Logano get his first NASCAR Cup Series crown?